No herb is better suited for first-aid uses than the cheery, golden flowers of Calendula officinalis. Calendula is easy to grow from seed and produces an abundant amount of flowers, which can be used in the kitchen, medicine cabinet, and for beauty products. One of my favorite preparations to make out of Calendula blooms is Calendula Salve. This salve is wonderful for skin health, and can be used for dry skin, cuts, scrapes, burns, eczema, blisters, and rashes. So plant some Calendula , and begin harvesting the flowers as soon as they start to bloom, cutting off a few inches of stem along with it. Hang them in bunches to dry, and keep them in jars or paper bags. 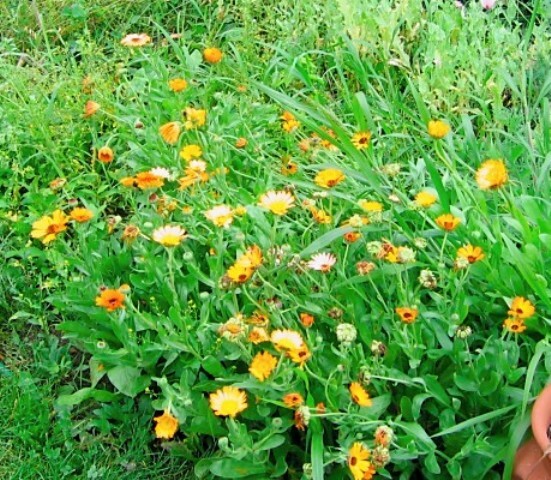 Alternatively, if you cannot grow Calendula yourself, find someone locally who can supply it or order it online. To make Calendula Salve, you will first need to make Calendula Infused Oil. The oil is simple to make, and you can make extra for other uses besides the salve. The infused oil is a nice moisturizer for the skin right after showering, and can also be used for skin irritations much like the salve. Clean and thoroughly dry the pint jar. Be sure there is no moisture present, since the least bit of moisture can cause mold to form. Add the dried flowers to the jar, and cover with olive oil to about an inch under rim to allow for expansion of the herbs. Cover the jar with a clean piece of cheese cloth, cotton cloth, or nylon and secure with a rubber band or string. Do not put the actual jar lid on yet, as some herbs release gasses while infusing that could cause the jar to break. Let the oil infuse in a sunny window for at least 10 days. Strain out the plant material and compost it. The remaining oil can be returned to the jar for storage, with the lid on, for up to a year. You can top the jar off with some extra olive oil if you would like to fill it the rest of the way; this also helps to avoid mold growth, since there will be less air space in the jar. Once you've got the infused oil made, you can move on to making the actual salve. In a saucepan, warm (but don't boil) the infused oil. In a separate saucepan, heat the beeswax just until melted. Pour the melted wax into the warmed oil, and gently stir until combined. Allow the mixture to cool slightly before pouring into jars or tins. Then, allow the salve to cool completely before covering. Store in a dark, cool place for up to one year. If you would like a thicker or thinner salve, try adjusting the amount of beeswax. The more beeswax you add, the thicker it will be. I like to keep my salve in the little, wide-mouth half-pint jars , but you can use just about any non-reactive container you can find. You will want to be sure that whatever container you use has a wide enough opening for you to comfortably get your fingers in, however. Once you have mastered the recipe, it is fun to branch out and experiment a little. Try using different dried herbs in place of the Calendula. For example, Lemon Balm is good for healing dry, cracked lips and cold sores; Lavender salve can be rubbed on the temples to relieve headaches; and Peppermint salve makes a good foot-rub for sore feet. Just be sure that whatever herb you choose is positively identified and non-toxic. In addition to trying different herbs in your salves, you can also experiment with using different types of oils when you make the Infused Oil. You can try using or combining other liquid oils, such as sunflower oil or avocado oil. You can even use solid oils, such as coconut oil or palm oil, as long as you melt it down with the liquid oils first. I like to add a little dollop of palm oil to my Calendula Salve, because it gives it a nice golden color. To do this, place both the liquid oils and the solid oils in a double boiler, and heat just until the solid oils have melted. Then use the oil blend in place of the olive oil in the Infused Oil recipe. Generally, you don't want the solid oils to make up more than 1/4 of the total oil, so that it stays liquid for infusing. It's such a rewarding feeling growing your own herbs and then putting them to a practical use! Your blog is great and already I've learned a few new things. I hadn't noticed you had one before. Signing up! Awww, thanks Journey11, I'm glad you are enjoying it! I will just take a quick peek at your comment before it posts to avoid getting bombarded by spam. Please don't take it personally, I'm sure you're a lovely person. A huge egg with two yolks in it? A wrinkly misshapen egg? An egg with a soft shell? Or perhaps the all-inclusive just plain weird looking egg? Why Did My Chicken Lay That Strange Egg? Are you looking for ways to save money? Who isn't nowadays? Every little thing you do helps and the small things really do add up. Which is why I have a somewhat creepy tub of soap scraps in my bathroom. I admit, it seems a little weird to save soap scraps, but it wasn't always this way. In fact, they used to have little contraptions for saving your soap scraps. But those days are gone. Or are they? I think frugality is making a comeback--at least, it is around here, because I save all our soap scraps. What do I do with them? If you are regular users of bar soap, a family of four can easily manage to get six additional bars of soap per year by saving soap scraps. It doesn't seem like much, so I'll write it this way instead: in ten years, that would be 60 bars of "free" soap. There, that seems more impressive. To avoid clogging and bad odors, sink and tub drains should be periodically cleaned. A once a month cleaning with a non-toxic, homemade cleaner prevents needing a stronger, usually sodium hydroxide (lye) based, cleaner to remove clogs. Sodium hydroxide is extremely caustic, and will damage the lungs if inhaled, burn skin and eyes, and can be fatal if swallowed. In addition, the heat generated by using sodium hydroxide can soften PVC pipes, and damage old, corroded pipes. It also changes the pH of water and can cause fish kills. A much nicer alternative to this harsh chemical is the simple combination of baking soda and vinegar, followed with boiling water. When baking soda and vinegar are combined, they foam and expand, cleaning the sides of your pipes and dissolving fatty acids. The boiling water then washes it all away. This method is a great way to use up the box of baking soda in your frig that is not longer doing a good job of deodorizing.